The first service of this congregation was held on October 10, 1702 at the Quaker Meeting House in Topanemus, near present-day Marlboro, led by the Reverend George Keith. Keith, one of the earliest settlers in Freehold, had been a Quaker but over time found himself at odds with that faith and returned to England to come an Anglican minister. He was then sent as a missionary to the Colonies and made several stops in Freehold to preach at Topanemus during his notable career. The meeting house was owned by Thomas Boels, a former Quaker who was brought back to the Anglican faith by Keith. Upon his death in 1709, Boels left the property to the "Anglican Church established at Topanemus," as the congregation was then known. While the early meeting house is long gone, the property and its historic burial ground are still owned and maintained by St. Peter's. 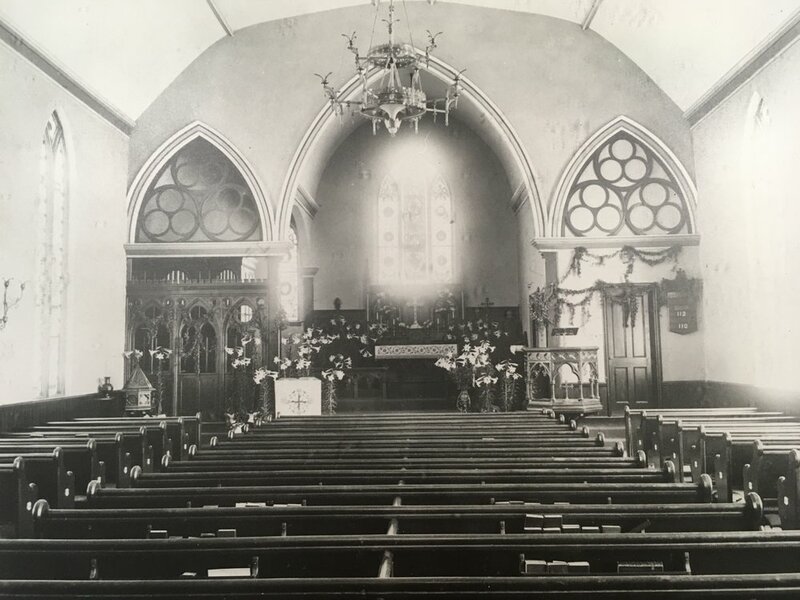 A photo of the church interior, taken between 1892 and 1896. Throughout the colonial period, a series of missionaries, appointed by the Society for the Propagation of the Gospel, served the congregations of Shrewsbury, Middletown, and Freehold. One of the most memorable of the early missionaries was the Reverend Thomas Thompson, who ministered to Monmouth County from 1745 to 1751. He left a record of his work in a book entitled Two Missionary Journeys, published in 1758. In it he describes ministering to older members of the congregation, teaching catechism to the children and baptizing slaves to bring them into the church. The congregation at Freehold received its charter from King George II in 1736. 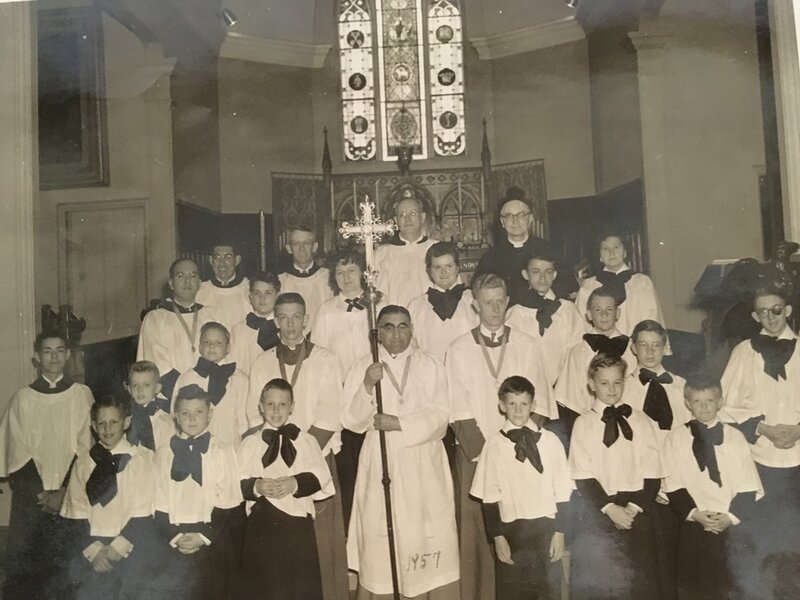 By that time the congregation had grown considerably and in 1738, the present property in Freehold was purchased, so that a new, larger church could be built in a location that was more convenient to most of the members. St. Peter's Church in Freehold was designed several decades later by one of the leading architects of the colonial period, Robert Smith of Philadelphia. Many of his important public buildings still stand, including Nassau Hall at Princeton University and Christ Church and Carpenter's Hall in Philadelphia. Smith was commissioned to design and build the church in Freehold, which was begun in 1771. The following year, the Reverend William Ayres noted "the New Church at Freehold Town is in great forwardness." Unfortunately, the economic and social impact of the Revolutionary War halted construction in 1775, although the structure was apparently framed and enclosed since it is said to have sheltered the wounded during the Battle of Monmouth and served as a storehouse for the Provincial Army afterwards. Photo circa 1957, taken by George J. Evans, Sr.
After the war, the vestry undertook to finish the church and contracted with local craftsmen to complete the exterior of the building in 1792 and to finish the interior in 1794. St. Peter's was finally opened for worship in 1797. The original church building was a 35' by 52' gable-roofed structure with two entrance doors on the Main Street side and a high pulpit with a sounding board with a communion table on the opposite wall. Box pews and common pews with high backs and ends faced the pulpit and were rented for an annual fee, which generated a major source of income for the church. In 1811 the Reverend John Croes, Jr., reported that "the Freehold Church by the liberality and exertions of its members has been very much improved and now puts on a decent appearance." In 1837, the Right Reverend George Washington Doane, Bishop of New Jersey, visited St. Peter's and is said to have been appalled to find the building in a state of deterioration. At his urging, the congregation began the first of several campaigns of alterations and renovations that occurred in the nineteenth century. The first changes were made to the windows and the church interior in 1838, followed by repairs to the steeple and the creation of an addition to the church on the east end. The pulpit and communion table were moved to the east end and the pews reoriented to face them. Two new entrances were created on the Throckmorton Street side and the balcony was probably added at that time. These major changes were in response to the Oxford movement, which advocated for more Catholic ritual in the worship service of the Episcopal Church. In 1841, St. Peter's was one of the first churches in Monmouth County to install a pipe organ. The first gas lamps were in use at St. Peter's by 1859. A small recessed chancel was created in 1864, again to accommodate changing worship practices. In 1878, architect Henry Dudley of New York City was called in to make further alterations to St. Peter's in the popular Gothic style. He extended the nave, installed the stained glass windows, and created the Gothic interior that we see today. 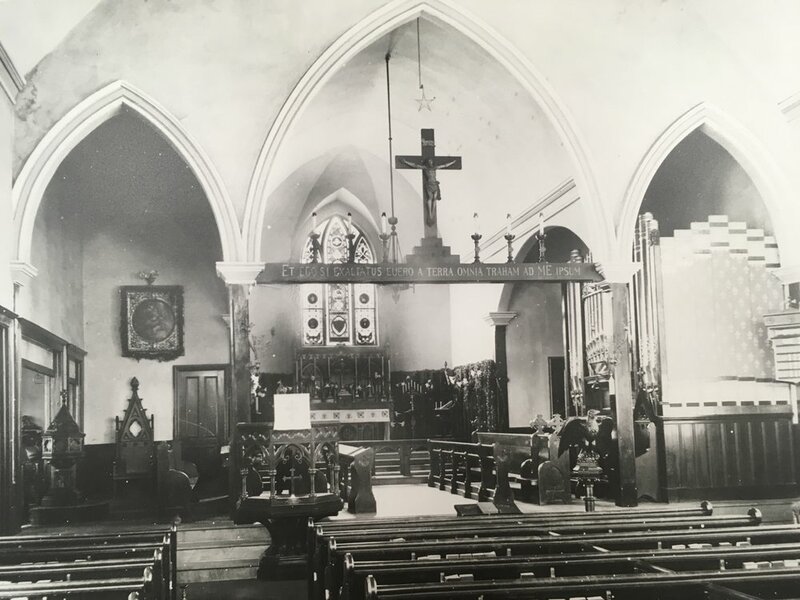 The church interior, taken after 1911. In 1902, a severe ice storm swept through Freehold, causing damage to a number of structures including the steeple of St. Peter's. Repairs were necessary to stabilize the steeple and replace the weathervane which had fallen to the ground. The 20th century brought a few minor alterations to the interior of St. Peter's, although Henry Dudley's design is still largely intact. One of only five eighteenth-century Episcopal (then Anglican) churches remaining in New Jersey and the oldest public building still standing in Freehold, St. Peter's Church is significant for its history as well as for the changes it has undergone over the years. The church still retains important elements of Robert Smith's design, including nearly all of his innovative timber frame system and complex steeple. The church was placed on the National and State Registers of Historic Places in 1997 and underwent a major restoration project with funding from the New Jersey Historic Trust, which was completed in 2002. The congregation of St. Peter's grew during the 20th century, first with the influx of English weavers who were recruited by the A & M Karagheusian Rug Mill in the 1920s, and then with the natural population growth that occurred during the post-World War II years. Today, in addition to meeting our own pastoral needs, we at St. Peter's are seriously committed to serving the needs of the larger Freehold community through a variety of outreach programs. Visit the Monmouth County Historical Association's excellent website for more information about historic Freehold. Sign up for our newsletter, the Peppercorn, to get the latest news from St. Peter's.